Here's a lovely Christmas gift for a crafty friend or family member. Or for you to make this lovely gift for a special little person. 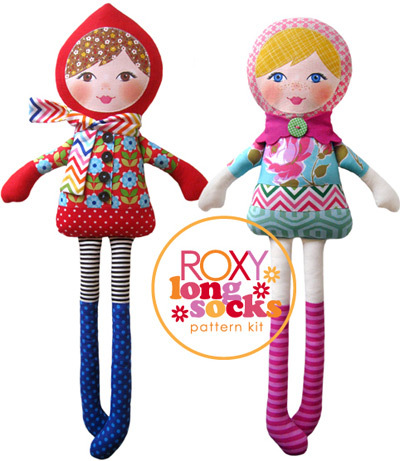 Lisa Tilse from the red thread has just released a new sewing pattern + fabric face panel for these super-cute Roxy Longsocks dolls, named after her daughter. How cute! The kit contains a sewing pattern and instructions and a face panel of your choice printed on linen/cotton blend fabric. 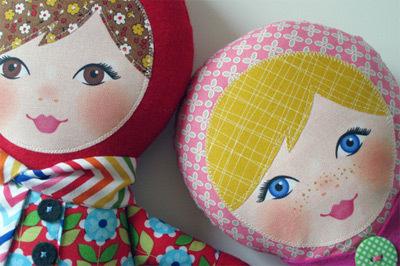 Then simply choose from your own fabric stash and stuffing to create the doll. It's also a great way to use up scraps of fabric that you love. The Springtime version features a mini capelet and the Wintertime version includes a scarf and goodie pattern.You can also make your own felt or fabric face with the included pattern. The finished doll is lovely and big at around 66cm / 22.5 inches tall. 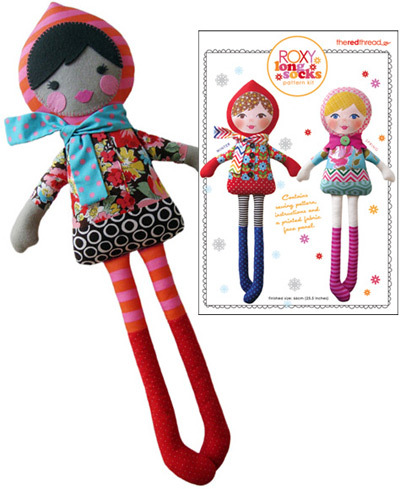 You can find Roxy Longsocks pattern and panels in the red thread online store and in select fabric quilting shops in Australia and New Zealand early 2012.
anyway to get an african american face panel?